The hairXcape innovative “hands forward” design was created not only for the industry professional, but most importantly for our customers comfort and their changing needs. 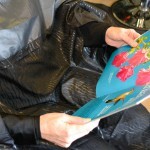 The hairXcape is not only the first styling cape to offer customers 100% clothing coverage during perming, haircuts, magazine/book reading and offers total freedom when using cell phones, ipad or any other activities that require full arm and hand access. Our patented “hands forward”sleeve design eliminates the need our customers to have arms and hands on the outside of the styling cape, avoiding the risk of ruined clothing from color or perm solution splashing on sleeves and potentially ruining clothing. 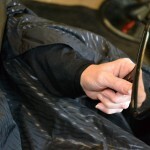 Customers can choose to use the hairXcape as a standard cape or utilize the”hands forward” sleeve for hands free convenience in todays busy multitasking lifestyles. I love this cape! 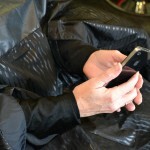 When I was getting my hair colored before I had to reach around the cape if I wanted to check my phone. With hairXcape I can easily use the front arm access to check my phone or read a magazine. No more worries of getting color on my clothes!